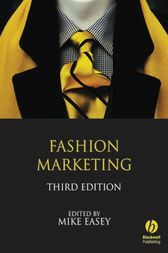 Knowledge of marketing is essential to help ensure success and reduce the risk of failure in fashion. For the designer starting up in business, this book offers a guide to the major decisions that will enable you to fulfil your creative potential and be a financial success: What are the major trends we should be monitoring? ; How should we set our prices? ; What is the most effective way to get our message across about the new product range? ; Which colour-wash will be the most popular with buyers? · a systematic approach to fashion marketing, not hyperbole or speculation. The new edition has been updated throughout with new material on different promotional media, visual marketing and international marketing research; and new coverage of internal marketing, supply chain management, international marketing communications as well as the role of the internet. See www.blackwellpublishing.com/easey for supporting pack for tutors, including PowerPoint slides for each chapter plus ideas and exercises for seminars. Mike Easey is Director of Collaborative Ventures in Newcastle Business School at the University of Northumbria. He has worked for three multinationals in marketing research, promotion and marketing planning positions. An experienced marketing consultant, he has undertaken an extensive range of consultancy work including marketing for fashion manufacturers and fashion retailers. He is also a university external examiner in fashion marketing, a QAA Specialist Subject Reviewer in marketing and a member of the editorial board of the Journal of Fashion Marketing and Management.